KYOTO (Kyodo) A large mounded tomb believed to date back to the mid-third century has been unearthed in the town of Mineyama, Kyoto Prefecture, archaeologists said this week. 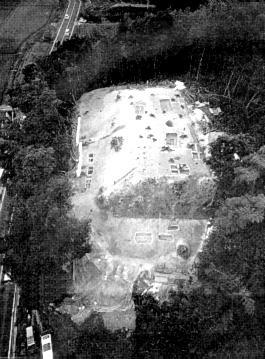 The Akasaka-Imai mound, one of the largest of its kind found in Japan, is believed to hold the largest burial facility of the Yayoi Period (300 B.C.-A.D. 300) at its center, they said. The archaeologists, from the Kyoto Prefecture Research Center for Archaeological Properties, said the main burial facility may entomb a powerful king from the Sea of Japan coast. The tomb, excavated by the foot of a hill in the town, measures 37.5 meters by 32.5 meters and rises to a height of 3.5 meters in the center, the archaeologists said. A terrace 5 to 6 meters wide encircles the tomb. In addition to the burial facility, 12 other graves  five at the upper layer of the mound and seven in the terrace portion - were also found, they said. An official of the center said: "The tomb's shape is different from those in other regions, such as Izumo and Kinai. It's likely a tomb of a king who had his own political territory and reigned in the Tango region." Izumo refers to Shimane Prefecture, Kinai to areas surrounding the ancient capitals of Nara and Kyoto, and Tango to the area around Kyoto Prefecture.